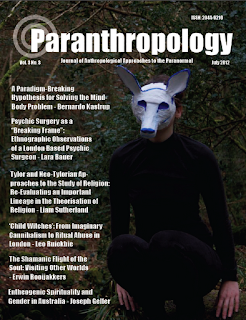 Cover of the Paranthropology journal. Nice job! Bravo! I really enjoyed the read. One question that arises though is how this universal mind relates to matter in your scheme. Is yours a fully idealistic proposition? Yes, my position is Idealism, though I don't bring that into the article in order to maintain the focus; it doesn't help to open two different fronts in the same paper. My post "The Brain as a Knot of Consciousness," in this blog, explains how I reconcile the 'filter' hypothesis with Idealism. Read the "Knot" post. I see what you are saying: the brain is an image of tightly-wound consciousness. Being an idealist then, do you disavow the existence of matter? I guess so, because otherwise you would have to uphold a mind-matter dualism. My question then is: how do you explain change? Seems to me that something has to be independent from mind to allow for the degradation towards death that awaits all things. I tend to subscribe to Hiroshi Motoyama's position that there exists a provisional mind-matter dualism and that this mind and matter are interfused a la panpsychism. Mind is what gives matter it's cohesive form, but ultimately matter's tendency towards chaos wins out. Like the forces of yin and yang sprung out of the Dao, Motoyama maintains that mind and matter were born out of what he calls Absolutely Nothing, a primordial ground of being which can be equated with Buddhism's emptiness. Motoyama's position is derived from Samkhya Yoga which maintains that the process of spiritual refinement entails liberating mind from matter until ultimately the dichotomy is seen through as fundamentally Absolutely Nothing. I'd be very interested to correspond with you on this subject. I don't disavow the existence of matter in the sense that I don't deny our _experience_ of matter; of a palpable, concrete world, obeying the so-called 'laws' of physics. But I do question whether that world -- that matter -- exists independently of mind. I think matter _is_ our experience of it; there is nothing to matter outside the conscious experience of that something palpable. So the so-called 'laws of physics,' in my view, are just 'laws of mind' (and here I am with Sheldrake, in that the 'laws' are probably more like habits). Once you acknowledge that the dynamics of mind are rich enough to obey a variety of patterns (laws, or habits), you can conceive a form of 'Dualism running on top of' Idealism. In other words, I can conceive of patterns of mind's flow that tend to entropy and chaos, and patterns of mind's flow that tend to order and complexity. If you call the former 'matter,' everything should come together neatly. I have read your article and would like to talk to you about some ideas. The first idea refers to when you write that if consciousness is fundamental, then it cannot be caused by the brain, but I think you're confusing two orders: the ontological order and causal order. Consciousness can be ontologically fundamental and still causally dependent of the brain. But anyway I agree with your filter model. Second, if I understand your position, then the foundation of reality is not material but mental, the collective unconscious. However, what you call "collective unconscious" is basically the same as what materialists call "matter", because in both cases we face the reality that resists our will, which ensures that match our experiences, about our experiences with coherence, etc., so that practically no difference between idealism and materialism. Yes, there are differences, but are merely metaphysical, almost without practical consequences. The predictions that you describe in the article also makes some kind of psycho-physical dualism, that is, realism about the mind and matter, so that these consequences do not count. But I wrote almost because the only practical consequence that comes to mind is that in the future (if idealism is true) develop techniques to voluntarily give orders to the collective unconscious and to alter reality in a radical way, as in the short stories "Casey Agonistes" by Richard McKenna, or in the novels of The Melancholy of Haruhi Suzumiya! But until then, I think to argue about which is the foundation of reality is useless and prefer to keep the realism of common sense. Third, you mention several predictions of the filter model , but do not mention the psi abilities such as telepathy and precognition, which also is a prediction of the filter model. You mention psi abilities in the NDE, but in a healthy condition psi abilities are also a prediction of the model filter. What's more, the psi abilities are the main consequence of the filter model because they are essential to distinguish the filter model and production model: if the production model is true, then all veridical perceptions are caused by the material senses, but if the filter model is true, veridical perceptions exist that do not pass through the material senses, because they are information that the brain has not filtered, which is precisely the psi experience. And fourth, according to your idealism, brain localize the impersonal collective unconscious to a given space-time, leading to a personal consciousness with its own history. Now, what about death? Does consciousness ceases to be personal to join the collective unconscious or remain personal? If you opted for the former, I think an impersonal life after death is not life really, because in the human sense life can only be I act, I perceive, and the I is personal. Although the most important thing is that all the evidence about the afterlife points to a personal life after organic death. Not only do the NDE (which your writing seems to be the only type of evidence for the afterlife you have in mind), but also the deathbed visions, apparitions of the living and dead, mediumship and children seem to remember past lives. Thanks for the extensive and thoughtful comments! > causally dependent of the brain. If consciousness is an ontological primitive, then it is not _generated_ by the brain. That's the sense in which I meant that it is not 'caused' by the brain. What the brain could then do is 'give shape' to a pre-existing consciousness, and 'cause' particular conscious contents in that way. Note, however, that this already comes pretty close to the filter hypothesis, in which the brain 'modulates' conscious contents. It's the same in the sense you are alluding to, i.e. mental contents that resist egoic will. But it's different in other fundamental points: Matter, under realism, exists outside of mind, while the collective unconscious is part of mind. This way, the 'laws of nature', in my hypothesis, are actually the 'laws' of mind. There could be practical implications of this differentiation, which you allude to yourself: If the 'laws' are in mind, and in fact are habits of mind, then they could in principle by hacked through as-of-yet unknown mental practices. So the collective unconscious is not really equivalent to our interpretation of matter under the physicalism. Potentially yes; in this specific article I don't go into Idealism. This article had to focus on one only issue to stay sharp: Showing that the brain does not generate the mind. I wrote it so as not to contradict Idealism, but I don't push Idealism in it. I also didn't want to make the argument dependent on Idealism. As it is, the article can hold under either Idealism or Dualism. Correct. And I agree with you that psi is an important prediction of the filter hypothesis. I didn't put it in because psi in itself is very polemic, so I didn't want to conflate issues. I chose to defend my argument with mainstream neuroscience data only, in order to keep it as clean as possible. > collective unconscious or remain personal? My personal opinion, based on personal experience and many other reports (e.g. NDEs, meditation, etc. ), is that a very significant form of personal identity survives physical death. It's not the ego, for the ego seems very grounded on brain processes (e.g. the default mode network), but something more akin to what Jungian's call the Anima/Animus or the Self. But the paper was about what I could substantiate, not necessarily what I think personally. I felt I couldn't substantiate survival of personal identity enough in the paper, without exposing myself to well-founded criticism. And then I didn't want to tarnish the clarity of the remainder of the argument with a potential weakness. So I wrote what I could substantiate, not necessarily the full extent of my personal opinion. Again, I think a form of identity much deeper than the ego (deeper enough to make the ego look completely irrelevant) does survive. If ultimately there is only one 'I', then yes, it is personal from its own point-of-view, but collective and 'impersonal' from the point-of-view of a differentiated ego like you or I right now. On the question of if consciousness is ontologically primitive, then it is not generated by the brain, Chalmers would not agree, because he believes that consciousness is ontologically primitive but is generated by the brain according to psychophysical laws. Anyway does not matter because I agree with you that all the current evidence, neurophysiological and parapsychological, discard the production model and supports the filter model. As you write a practical consequence of your idealism is the theoretical possibility of altering reality in a radical way, but what I wanted to say is that until we find evidence that this is possible, support the idealism is too reckless. Although we may already have some kind of evidence. You know the story of the French explorer Alexandra David-Neel? She was the first Western woman to reach the capital of Tibet, and by his writings, she was successful in creating what Tibetan Buddhists call "tulpa", an idea that by the mere force of imagination ends up being real and perceived anyone. At first the tulpa created by David-Neel only what she saw, but eventually came to be seen by anyone who approached her. Something extraordinary, but Tibetan Buddhism goes one step beyond saying that the whole universe is a tulpa, and affirm your idealism. However, this is precipitated, because that tulpas are possible does not mean that all the material world is a tulpa, although the possibility of tulpas may be evidence in favor of idealism. Finally, I am not very familiar with meditation, experiments with psychotropic substances, etc., So in my case by evidence converging on the NDE, the deathbed visions, apparitions of the living and dead, mediumship and children who seem to remember past lives I have come to conclude that there is a personal life after organic death. I think it's a mistake to stick to the NDE and experiences with psychotropic substances when we have other evidence, yes, controversial, but rather more strongly about this issue. This sounds like a direct contradiction of terms to me. I didn't really say 'radical.' Whether radical or not doesn't seem important to me. If the 'laws of physics' are in fact habits of the (unconscious) mind, it seems to me that the habits could conceivably drift slowly over time. But this possibility, to me, is not at all what makes Idealism interesting. I am not looking for practical applications like "The Secret," but simply trying to find the best explanation for the data at hand. > idealism is too reckless. I'll beg to disagree completely here. I see nothing 'reckless' _at all_ in Idealism; not any more than materialism is 'reckless.' This is not about emotions or even practical applications, but about what which metaphysics fits better with the data at hand. I think there are good rational and empirical reasons why Idealism fits better with the data, even if there is not one practical application of it. To me, the choice of Idealism has nothing to do with the potential to 'change the laws of physics' or anything of that nature. It has to do with coming closer to the truth, whatever it may be. It also has to do, for me, with dispelling the pernicious materialism myth that consciousness ends, given that it is not the metaphysics that best fits the data, in my view. You consider that idealism is the best explanation of all the data, but I do not think so, because the dualism also explains all data without rejecting the realism of common sense that I do not reject. In my opinion, the idealism is only acceptable if confirmed some of its practical consequences, that is, if we could voluntarily give orders to the collective unconscious to radically alter reality. As for now these effects have not occurred, is precipitated accept idealism, so I wrote that it would be reckless to accept idealism. That is, find the truth for practical applications, not greater explanatory power. "Giving orders to the collective unconscious on a voluntary basis to radically alter reality" is CERTAINLY NOT a practical consequence of Idealism. Idealism is not the "law of attraction" or any related New Age stuff. Such is a very naive conception of what Idealism entails. I refer you to other articles of this blog, my books, and my videos for a serious philosophical articulation of Idealism. It can even "host" a kind of Dualism in the way that an operating system can host another but, in my view, Idealism remains fundamental. Cheers, B.
Bernardo, I just listened to your Skeptiko interview for the second time and also just finished your Paranthropology paper. I immensely enjoyed both. There is a clarity and straightforwardness in your reasoning and language that I really appreciate. I especially like your mix of scientific evidence with philosophical argumentation. I have always felt that scientists putting down philosophy just results in them doing bad philosophy. In the paper, I appreciated you drawing out the ridiculously promissory nature of the materialist position. I also thought your list of cases in which brain functioning is suppressed yet consciousness expanded was extremely effective. I've never seen a list that was that full before. I have a few questions. First, explaining the localization of consciousness with the analogy of a plant capturing sunlight for its benefit has an inherent plausibility, yet at the same time it seems highly speculative. Do you have any evidence for this speculation? Also, you seem to be implying that the localization is imposed on consciousness by the physical mechanism of the brain, rather than being a choice coming from within consciousness itself. Is that what you are saying? If so, what do you do with the data of NDEs which seem to imply a continuing localization of consciousness beyond the body, albeit a perhaps less bounded one? How good do you think the evidence is for the Jungian collective unconscious? I am very sympathetic to the idea, but I would like to see more evidence for it. I remember reading that a study of children's dreams did not yield what we would expect from Jungian thought--all sorts of universal archetypes showing up in the dreams of children who had no acquaintance with those mythological motifs. Finally, your initial right turn away from the materialist model seemed to be due to the Groblacher et al paper. Since that paper seemed to do so much work for your argument, I would have liked to hear more about the specific conclusions of that paper. In spite of these questions, I thought your basic argument was refreshingly clear, straightforward, and, once laid out, intuitively obvious. I hope your paper gets some traction (although I wish the journal cover had been a bit more befitting of your subject matter!). > you have any evidence for this speculation? Objective evidence for a 'field of consciousness' in the way we have objective evidence for an 'electromagnetic field' is, almost by definition, impossible. This 'field of consciousness' is _consciousness_; your consciousness right now. It's not outside of you the way sun light is, so you cannot measure it objectively, since it _is you_. You can only experience it directly. This self-referential nature of the 'field of consciousness' puts it in an ontological category quite separate from everything else, so it shouldn't be judged based on the same assumptions as anything else. > being a choice coming from within consciousness itself. In the paper, this is what is implicitly suggested. My broader philosophical position, however, is that the brain itself is a 'knot' of consciousness (see: http://www.bernardokastrup.com/2011/12/brain-as-knot-of-consciousness.html). So to say that the brain limits consciousness is equivalent to saying that consciousness chooses to limit itself, since the brain is a construct of, and in, consciousness. In the article, there was no opportunity to elaborate on these deeper questions, since it needed to be focused on one single key point. The key point I chose was to dispel the myth that mind is created by a material entity outside of mind. For this reason, there was some Dualism sort of implied in the paper, even though I am not a Dualist (but rather an Idealist). > perhaps less bounded one? I do not exclude the possibility that the brain structures that form the ego are just one level in an otherwise invisible (from the point of view of the ego) hierarchy of localization mechanisms. Once the ego is out of the picture (i.e. physical death), I do not exclude the possibility that consciousness simply 'hops' one level upward, to the next level of localization. The brain may be just the visible tip, or echo, of a fractal structure of self-similar localization loops. The ultimate level, of course, is oceanic awareness without localization. > hear more about the specific conclusions of that paper. Bernardo, thank you very much for your quick and helpful reply. I'm following up on the links you kindly provided. I understand your idea of the brain as consciousness choosing to limit itself, and remember your analogy of a whirlpool from the Skeptiko interview, which I thought was very effective. And I am glad to see your view that "The brain may be just the visible tip, or echo, of a fractal structure of self-similar localization loops." That is very much how I see it. I've thought of it as the brain being the bottom-most filter in a series of ever-widening filters. I totally agree with the self-referential nature of consciousness. I think I could have been clearer in stating my question about the plant analogy. My question really is: Is there evidence for your idea that the brain is there to localize consciousness for the sake of the body's survival? I ask because that intuitively strikes me as upward causation, with the body's needs driving the localizing of consciousness. Yet your model seems to include a lot of downward causation, which, it seems to me, would tend to explain the brain more as a vehicle for consciousness' choice to limit itself (whatever the nature of that choice may be). Do you see what I'm driving at? > you see what I'm driving at? Oh, yes, I see now. It's an excellent point, I think. The possibility that this speculation opens is that consciousness uses evolution as a tool to localize itself through iterative improvements. Evolution may just be 'consciousness doing its thing,' if you catch my drift. I understand the need to choose carefully one's battles in a paper. And I believe I do catch your drift. I enjoyed the evolution post and video. They have definitely left a mark in my thinking. Thank you! I'm following your posts and videos for a few months now and I'am literally "glued to the screen" every time you share some of your ideas and thoughts with us. Having a background in computer science and philosophy myself I highly appreciate your stance and courage to reach beyond the current dominating paradigm by means of rational argument and critical open-mindedness. This is exactly what is needed these days while especially recently one gets a gut feeling that some fundamental change is ahead - even (or precisely) when talking with hard-boiled physicalist colleagues. Anyway, here's a link to a recently published article from Chopra, Kafatos and Tanzi that points very much in your direction of thought (I guess): http://www.sfgate.com/opinion/chopra/article/A-Consciousness-Based-Science-3850763.php. Possibly you know the authors and their publications already. I don't care that much about Chopra (with all respect, but there are so many "Chopras" out there writing and saying nice things) but Kafatos and foremost Tanzi are highly respected members of the scientific community which makes the bold statements in the article even more fascinating to me. I you have the time I would appreciate your feedback on this article. First of all, many thanks for the encouragement and apologies for the late reply. I finally got a chance to read the article you referred to. Yes, I agree with the article and it is indeed in-line with my philosophical position. To split hairs a bit, I would probably have nuanced a bit more the references to quantum physics, since there are many interpretations out there. But that's detail; the main thrust of the article is entirely consistent with my philosophy, as you remarked. The article is somewhat superficial, but worthwhile nonetheless. Matter is 'thought' condensed, i.e. conscious manifest from the unconscious. And that is a way for 'all-that'is' to know itself. hence organising itself in all possible complex organisations, each being a unique perspective of itself. Just as our brains have evolved, as once we have 'practiced' something enough, i.e. focussed on it consistently it becomes a subconscious which frees up our conscious mind to focus on new information, precipitating and storing the program of whatever progress was made. So we could consider ourselves as processors for decoding as well as manifesting reality. An invention may seem to come out of no where, but it is the precise content of information and the organisational abilities of the mind of an inventor that 'manifests' it from the collective information field. Some 'masters' and yogis in India have been known to be able to manifest matter , because they have identified with a larger aspect of their own consciousness, and can speed up the process enough to 'create', something out of seemingly nothing. Its all energy anyway. There is an incident of a yogi who having identified with the larger aspect of reality, all being a fundamentally the same 'bed' or foundations, who could walk through walls and many such seemingly crazy feats which are known as 'Siddhis', as a person grows spiritually beyond the understanding of physical reality. You can affect the atoms of your own body and elements when you have reached the perspective that matter is indeed an illusion (maya), and it seems fixed because we are mesmerised by its forms and assume an observer mode rather than understanding it is our own energy that keeps it that way. Ancient indian Gods, were known to perform many feats which seemed like magic, but what if they just were another race of spiritually evolved being, more self-realised, and able to affect matter. The basic premise is matter is an illusion, we literally are the infinite, and the more you can identify with that extent, the more you can affect matter at the most fundamental level. Everything is one, but has differentiated into different forms, much like how Cymatics shows each pattern can be induced with a slight change in the 'frequency'. These are ideas from Indian Vedanta and advaita philosophies. You will probably find them interesting. Remote viewing etc were also very commonly used by ancient 'rishis'. I realise this may not be pertinent to the tone of the discussion here, but it really is worth looking into, as probably the next step for understanding the bigger picture and possibly the next state of evolution. The more we identify with our broader more spiritual nature, the more we grasp the bigger picture and the abilities to affect it. The ones who remain transfixed in their detachment to matter, seek to manipulate it with much cruder means, because they are unable to extend their influence having believed the illusion of being apart from it. If a person can create a field around them, through a strong sense of self-awareness, as to consciously control everything that enters it, they could affect everything in that sphere, without requiring crude tools, simply by their minds. That level of identification and understanding however does require some focus and commitment.